With CouponSurfer Rewards, link your credit or debit cards for free. 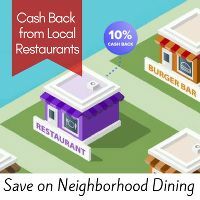 Dine or Shop at 1000's of participating places to get up to 10% cash back automatically when you pay with a linked card. Browse our list of participating stores and restaurants. Link your credit or debit card for free to automatically get cash back at places near you. Have I Linked my Cards?